Editor/Author Treas, Leslie S. and Wilkinson, Judith M.
Thinking. Doing. Caring. 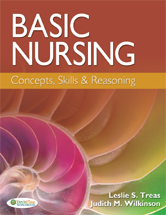 Leslie S. Treas and Judith Wilkinson, the team that brings you the two-volume approach featured in Fundamentals of Nursing, integrate all of the content and features that are its hallmarks into one carefully designed and written volume that teaches you to "think like nurse" from the very first day. In every chapter, you'll first explore the theoretical knowledge behind the concepts, principles, and rationales. Then, you'll study the practical knowledge involved in the processes; and finally, you'll learn the skills and procedures.